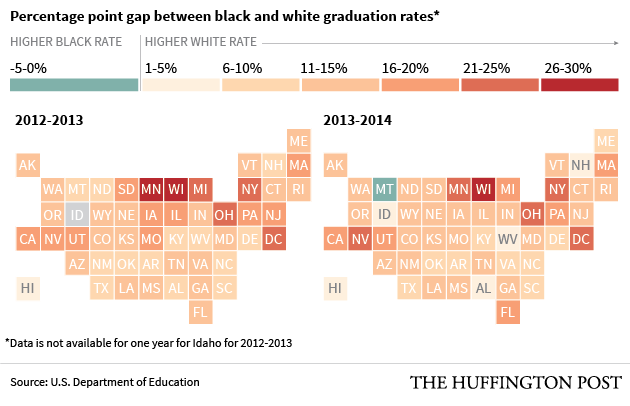 Achievement gaps are narrowing, too. Education Secretary Arne Duncan and John King Jr. -- who is set to replace Duncan during the upcoming months -- in October 2015. The U.S. high school graduation rate reached another record high in the 2013-14 school year, with teens graduating at 82 percent, the U.S. Department of Education announced Tuesday. The announcement comes after the Education Department released preliminary data in October showing a decreasing gap in graduation rates between black and white students and white and Hispanic students. The new data shows that graduation rates climbed for the nation as a whole. The U.S. high school graduation rate has steadily increased for the past four consecutive years, after states and districts started using a new, uniform metric to measure this number in 2010. During the 2012-13 school year, the overall graduation rate reached a historic high of 81 percent. The new data shows that graduation rates have increased across the board for the past several years for subgroups like low-income students, students with disabilities and English language learners. Further, the achievement gap in graduation rates between black and white students and white and Hispanic students continues to narrow. During the 2010-11 school year, there was a 17-point percentage gap in graduation rates between black and white students. By 2013-14, this number had decreased to 14.8.